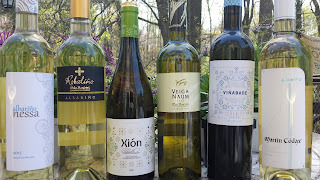 Since An Introduction to Galicia's DO Rías Baixas was published three weeks ago, I've been able to sample the half dozen wines through the weekly #WineStudio Twitter chat (Tuesdays 9 PM ET). The primary conclusion so far is that the wines are generally bright, with a lemon character, various degrees of salinity, and racy acids. In other words, a wine to pair with seafood like oysters and clams or to sip in the sun: a beachcombers wine. Got that OBXers. I'm already looking forward to clamming in the Albermarle Sound. 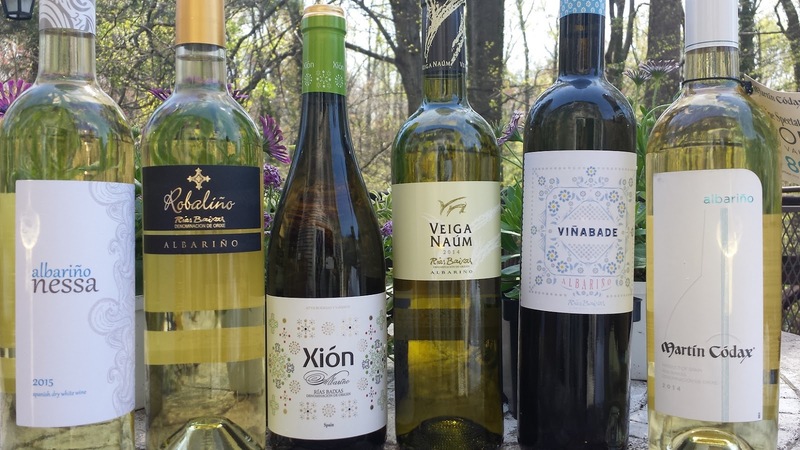 These wines are 100% Albarino and excellent values as the suggested retail price in this group ranges from $14 to $17. 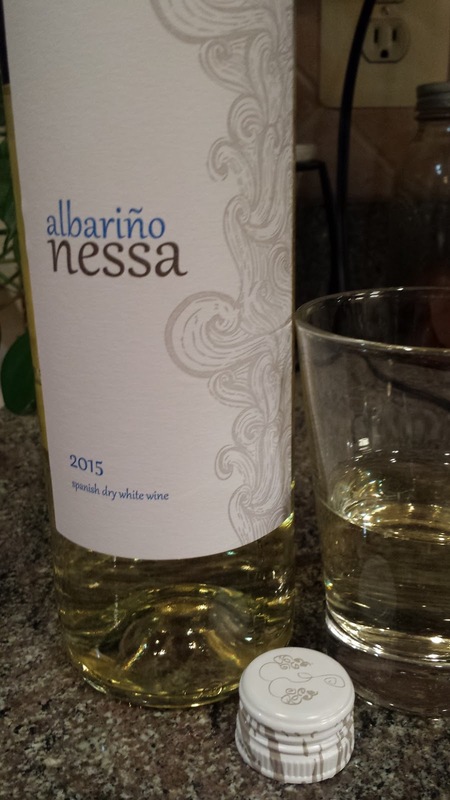 Keep following the #Winestudio session as it continues into May with Albarino blends and other wines from DO Rias Baixas. Cheers. On Friday afternoons and Saturday, take a moderate bike ride from Vienna's Caboose Brewing Company to Sterling's Beltway Brewing Company and quench your thirst with a low abv Berliner Weisse. 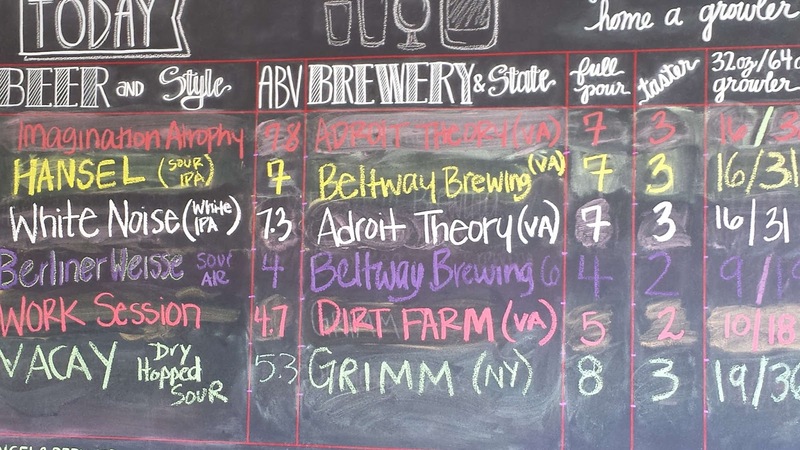 The tasting room at Beltway is only open during this period so plan accordingly. The brewery provides samples of their contracted brews plus two house offerings - one being the Berliner Weisse Sour Ale (4% abv). This is a refreshing ale, light, very fruity, and tart. Approximately 11 miles to the east, Caboose has been pouring their The "Zoo" Berliner Weisse (3.4%) since their inception last year. The latest iteration is a little less fruity and comes across dry and effervescent- but with a dose of sour and tartness. 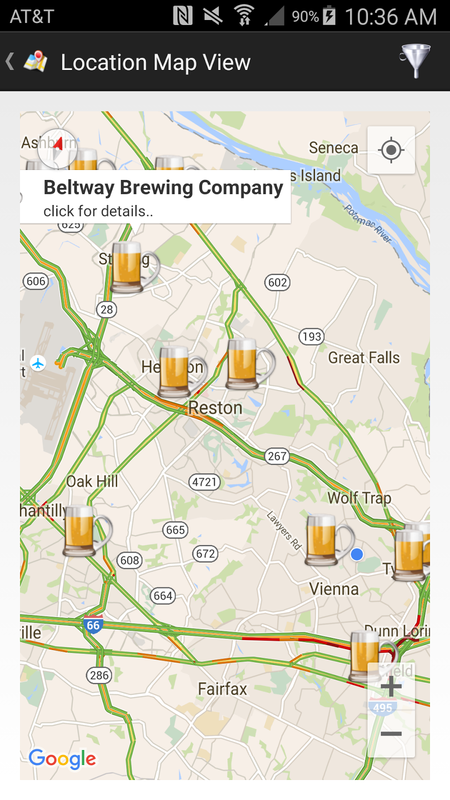 And as always, theCompass Winery, Brewery, Distillery Locator Mobile App can guide you to all the breweries and wineries off the W&OD Bike Trail and beyond. Briney Melon Gose, Where Art Thou? 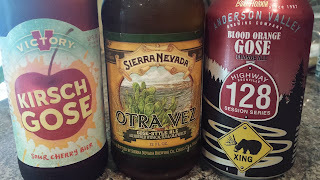 This week I failed to grab the newest Anderson Valley Brewing Company Gose release, Briney Melon Gose, so I decided to drown my sorrows with my existing Gose collection. This tart style is traditionally brewed with salted water, malted wheat, and augmented with Coriander and originated in Goslar and Leipzig Germany. The tartness is created using lactic bacteria and is normally comparable to a Berliner Weisse. And like the Wit beer style, Gose has been resurrected by the American craft beer industry. My favorite American version remains the Anderson Valley Blood Orange Gose (4.2% abv) - which provides both tartness and tangy flavors. 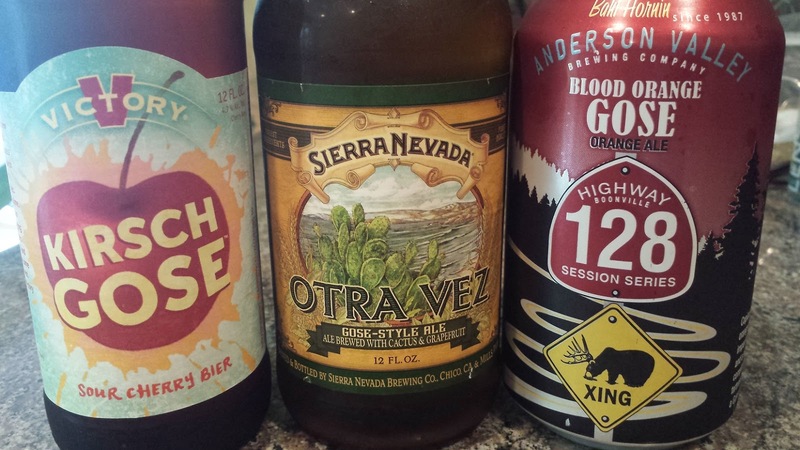 Sierra Nevada Brewing Company Otra Vez (4.5% abv) is a new year-round offering that includes prickly pear cactus and grapefruit that is bittered and finished with experimental hops. Once again the tangy infusion of fruit completely compliments the tartness. There's also a pronounced hop presence at the finish which also blends nicely. The Victory Brewing Company Kirsch Gose (4.7%) comes across the tartest with cherries and cherry juice added after fermentation. The cherries dominate and the finish is a bot creamy sweet and dry. 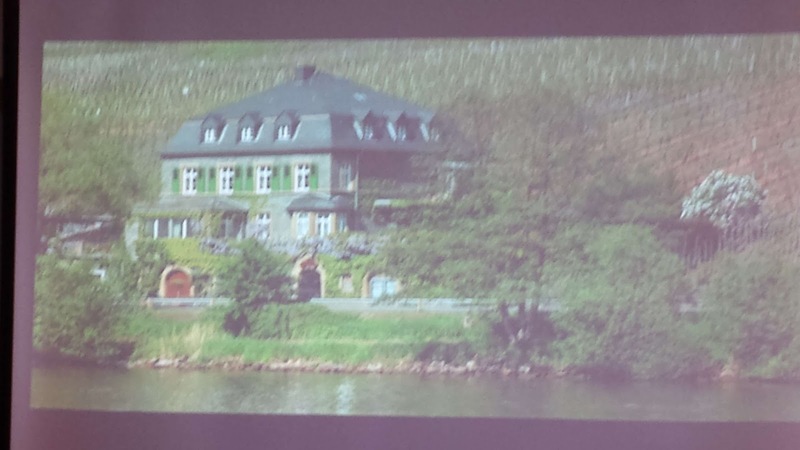 The Mosel Valley is one of the few areas where phylloxera won't survive in its porous sandy soils. Thus vines are planted "ungrafted" on original rootstock. And many of these ungrafted vines are well over 100 years old. 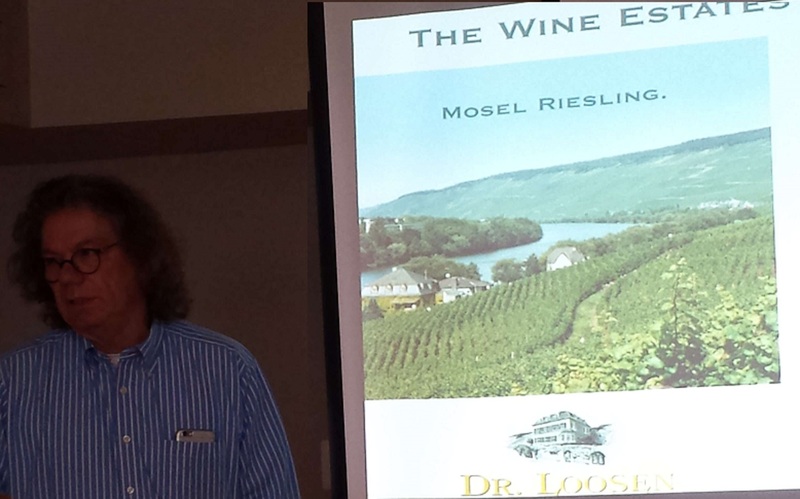 These were a few of the many facts I learned from Ernst Loosen during a recent Dry Riesling seminar at Cork Wine Bar. During this event, the popular and influential owner of Germany's Dr. 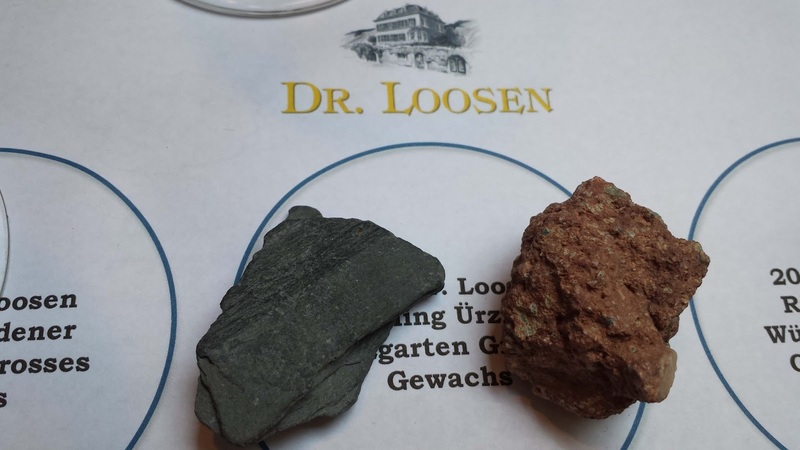 Loosen winery discussed his family's history, the topography of Mosel as well as Pfalz (home to his Villa Wolf brand) and poured many delicious dry Rieslings. In the Mosel Valley, vineyards are generally steep, south facing, and in many cases comprised of red or blue slate soils. Ernst spent considerable time discussing these slate soils -- particularly with a map displaying vineyards by soil type. Besides being well drained and nutrient poor (forcing the roots to dig deep), the slate also radiates heat creating mini micro-climates. The vineyards are also protected from "foul" weather drifting over from France by the Rhenish-Westphalian Slate Mountains. 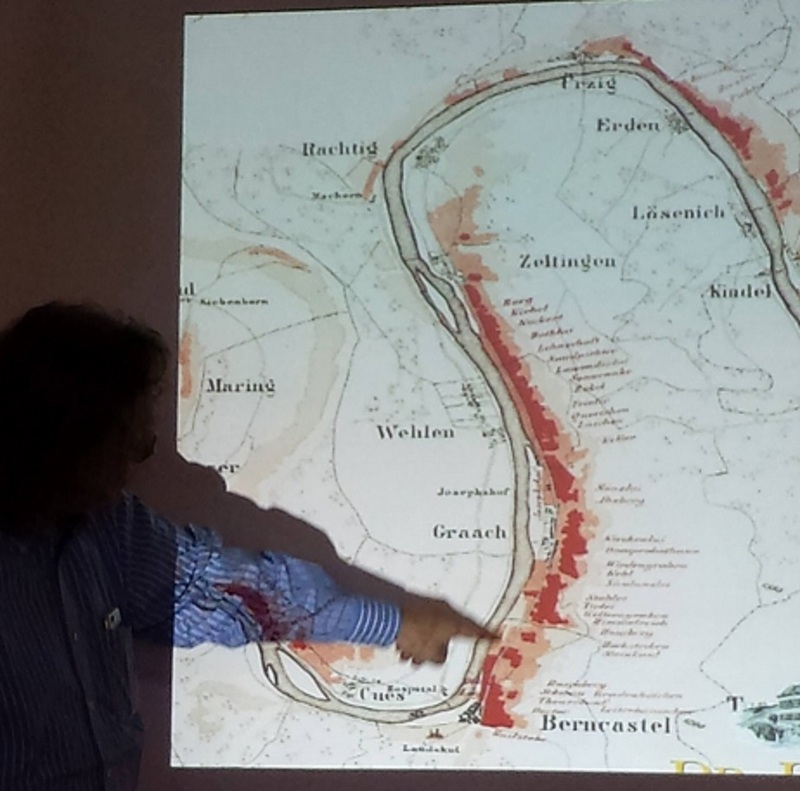 And as stipulated by an edict from the 1700s, only Riesling can be grown in the Mosel Valley. Ernst also discussed the Dr. Loosen pedigree as the estate has been in the same family for 200 years. His grandparents had two separate estates and these were joined by marriage with the current winery coming from his grandmother's holdings. Interestingly one side of the family only produced dry Rieslings whereas the other only sweeter versions. Today, the winery's six major vineyards are designated as “Erste Lage” -- equivalent to grand cru -- as designated in the 1868 Prussian classification of Mosel vineyards. Wines from these estates are designated single-vineyard whereas all other Dr. Loosen wines are labeled as estate wines. Ernst also stressed how Dr. Loosen Rieslings can age, both in the bottle as well as in the large oak casks used for fermenting and aging. In fact, through a friend of his grandfather's he learned about a method of extreme aging.. He conducted his own experiment and by creating a reductive environment with continual topping off and making sure the yeast were still active, he was able to validate that a wine could age 17 years in cask was still by lively and vibrant. The extended maturation in the cask, on full lees, stabilizes the wine naturally and provides time for it to develop structure and deeper complexity. Seventeen years is by no means a standard practice but they do age most of their Rieslings on the lees for at least a year -- and usually for two. This is the winery's entry level wine made from contracted fruit that Dr. Loosen's vineyard manager oversees. Most of these vineyards reside in blue slate soils. For such an inexpensive wine there is a pronounced floral aroma, a touch of minerals and racy acids. This wine is made from red slate estate vineyards in Erden and Ürzig and fermented on its less for 12 months in the 3,000-liter oak casks. 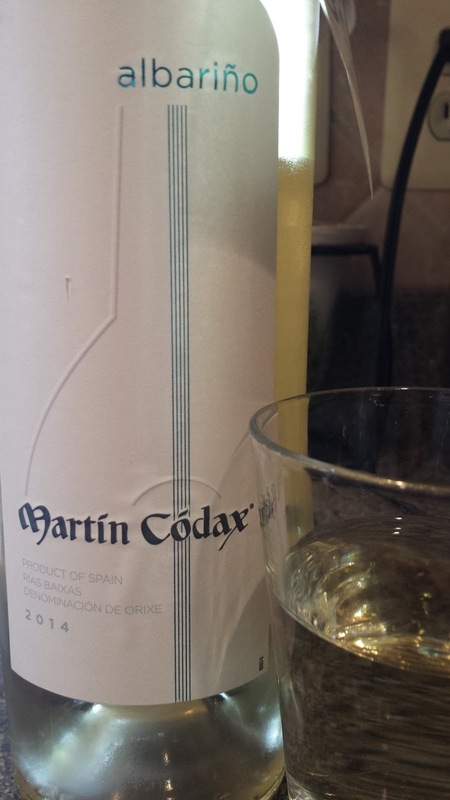 This is a richer, rounder, and more elegant wine, with intense minerals that compliment the citrus profile. The finish is more subdued but plenty refreshing. This single vineyard GG wine comes from the steep and rocky blue slate vineyard (VAY-len-er ZON-en-ooer) where the vines are well over 100 years old. The wine is fermented and aged in traditional 1,000-liter Fuder casks on less for one year. The result is a full bodied, yet feminine wine showing more apple over citrus and still plenty of acids for a refreshing finish. Ernst refers to this wine as a graceful ballet dancer. Long ago, in order to tend the vines, workers built stone steeps into the hillside of this red slate vineyard. Ernst referred to this wine as a "mountain climber", not only referencing the stone steps, but also because it is a muscular wine - complex and intense. There is also a considerable mineral content - almost minty in flavor that helps transition the wine from its wet stone aroma to the finish. The steep Ürziger Würzgarten (ERTS-ih-ger VERTS-gar-ten) vineyard was planted in red volcanic soil over 100+ years ago. Like the other GG wines, this one is fermented and aged in Fuder cask for one year before bottling. The herbal aroma is overpowering with the palate exploding with tropical and mineral driven flavors. Another intense offering. This reserve wine is the same fruit from the previous wine, but kept in oak for 24 months and then aged a year in the bottle before release. Whereas the GG version was intense, this wine is smooth and elegant - almost delicate. The acids are soft, but still refreshing. Fantastic. 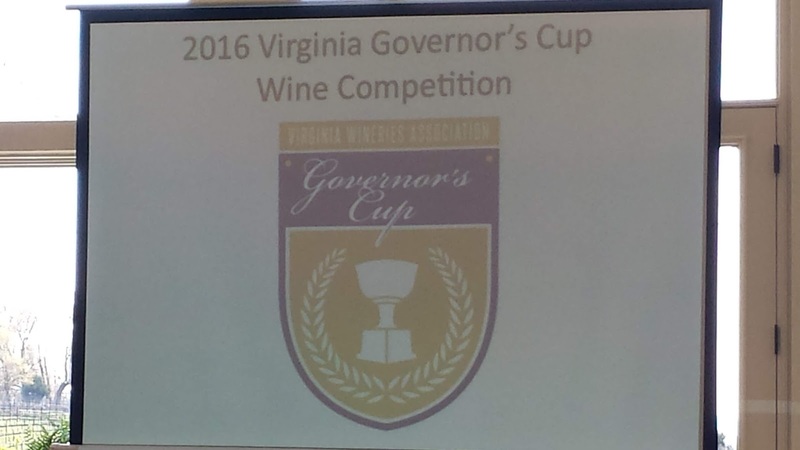 With the conclusion of the 2016 Governor’s Cup® competition, the Virginia Wine Board and Virginia Vineyards Association have organized four regional Governor's Cup Case educational series. 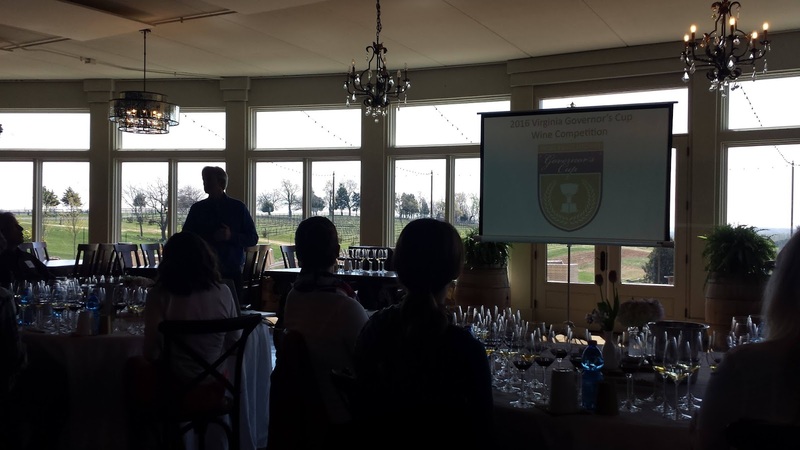 These forums are designed to introduce the dozen wines in the Governor's Cup Case as well as to allow the winemakers and vineyard managers to discuss their practices that lead to their specific award winning wine. At the first forum this week hosted by Stone Tower Winery there was plenty of vineyard and winery conversations regarding trellis systems, cold soaking, yeast strains, pH, and racking. And as Doug Fabbioli commented, "it was nice to see open secrets being shared" among the wine makers. Only wines made from 100% grown Virginia fruit are eligible for the Virginia's Governor's Cup and at the 2016 competition 38 of these wines were awarded Gold medals (they scored an average of 90-100 points). 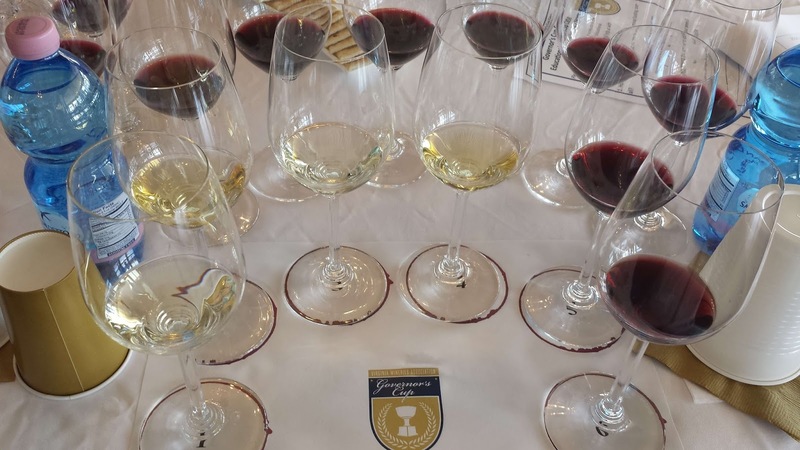 The twelve wines with the highest average score were identified as the "Governor's Cup Case". The wine with the highest overall score is the Governor's Cup Winner and in 2016 that honor went to the Keswick Vineyards 2014 Cabernet Franc Estate Reserve. Congratulations to winemaker Stephen Barnard and the Schornberg family. Master of Wine Jay Youmans directed the competition judging and will present the wines during these educational forums. What is readily apparent in both the case wines as well as the list of gold winning wines was the dominance of Cabernet Franc, the ascendancy of Petit Manseng, and the absence of Viognier -- the commonwealth's allegedly signature grape. Cabernet Franc is well suited to the Virginia environment, from it's clay soils, early ripening, and loose clusters and Youmans noted that almost all the case club reds were either 100% Cab Franc or included some percentage of the grape if a blended wine. The winemakers who attended the forum were very enthusiastic about Petit Manseng. Like Cab Franc, the grape grows in loose clusters allowing moisture to evaporate before inducing rot. The small, thick skins also protect from our summer humidity. The downside is these small grapes produce small yields - although it appears Horton Vineyards coaxes a larger yield than other vineyards. Neil Glaser of Horton also recounted how their winery was the first in the United States to sell Petit Manseng in 1999 when the grape variety was not registered with the TTB as a grape name. Thus the winery labelled the wine as a place name until the following year when Jenny McCloud of Chrysalis Vineyards petitioned to have the grape name added to the official registrar. Since Petit Manseng can be produced in a range of styles from dry to semi-dry to a dessert wine, the winemakers discussed the difficulty in marketing the wine. For instance, the Michael Shaps 2014 Petit Manseng is completely dry whereas the Horton Vineyards 2014 Petit Manseng is made off dry, the more traditional style for this highly acidic grape. Youmans commented that unless Virginia winemaker's devise a labeling scheme the wine may encounter the same consumer confusion as Alsatian wines where the consumer has no idea of the wine's sweetness until the cork is pulled. After tasting the dozen wines I was impressed with the breadth of quality from the older, more established wineries to the smaller or younger establishments. Stone Tower's first estate wine was impressive and a visit to relative newcomer Granite Heights must be planned. Bluestone has landed in the case club a couple times recently and demonstrates that as consumers we should not ignore the Shenandoah Valley. 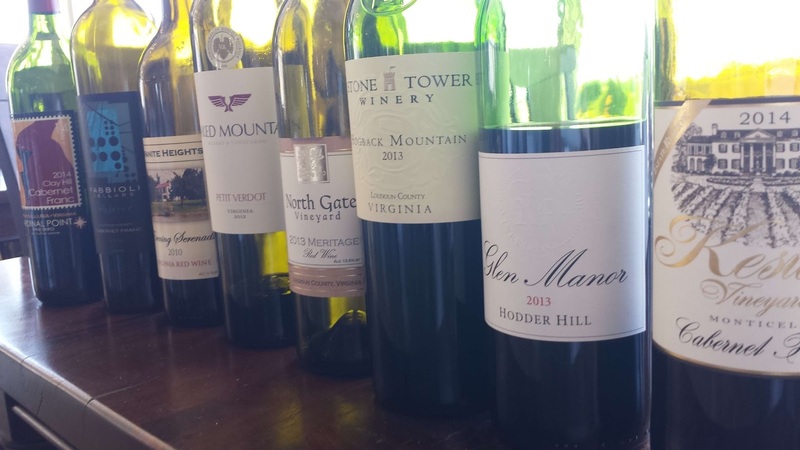 Also geographically, Loudoun County provided three of these wines and the Monticello region five. 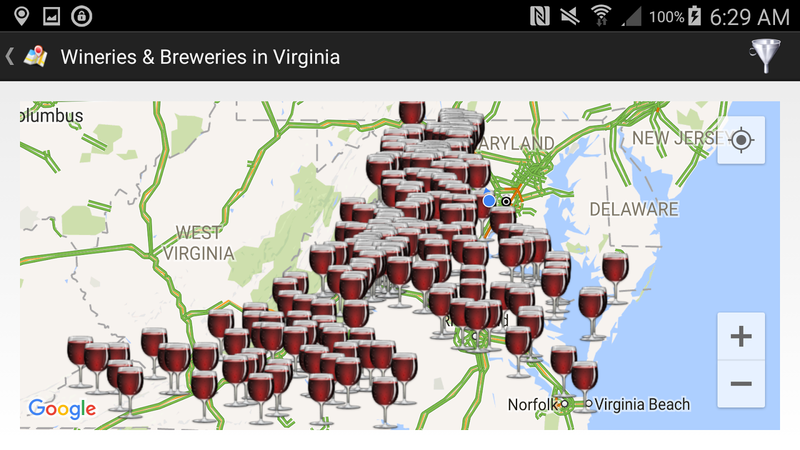 But cheers to all Virginia wine and the winemakers and vineyard workers who are making the industry successful. After our Southern Fried Chick-Filet, Peter was interested in the numerous cheese offerings which I never realized was that expansive. We choose a sampling of three, one Caromont Red Row (raw cow’s milk) from Virginia, Spring Brook Reading (raw cow's milk) from Vermont, and a cheese to be named later. I paired these with the NABI Farmhouse Ale (4.5% abv) and an unwittingly excellent choice. The funky and yeasty ale paired well with each of these cheeses. And for now the NABI is my favorite Right Proper beer. Next stop, the Brookland location. 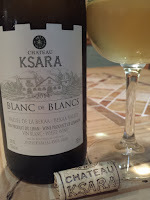 Last August during Wine Bloggers Conference 2015 I was able to sample a few Bordeaux styled red wines from Lebanon's Chateau Ksara. They were the Château Ksara made from Cabernet Sauvignon, Merlot, and Petit Verdot grapes and oak aged for 18 months; the Cuvée IIIème Millénaire Ksara’s flagship red; and the 100% Cabernet Sauvignon. These wines were big and bold wines with structure and plenty of tannins. And priced very reasonably. Wine making in what is today Lebanon dates back nearly 9,000 years ago and in Antiquity, from 3000 BC until Roman conquest, the Phoenicians exported wine throughout the Mediterranean. This trade pattern continued into the Middle Ages facilitated by Venetian merchants. Even when Lebanon was absorbed into the Ottoman Empire wine making was permitted for religious purposes allowing the Christian community to continue the tradition. In the mid 1850s, even with political strife occurring often, the modern Lebanese wine making industry commenced when Jesuit missionaries introduce new viticultural and vinicultural methods as well as new vines from French-governed Algeria These priests planted vineyards in the Bekaa Valley which is known for its Mediterranean climate consisting of hot dry summers with cool nights,and its own natural water table from melting snow from surrounding mountain ranges. Indigenous varieties grown since the Phoenician period such as Marami and Baytamouni were replaced by French varieties such as Syrah, Chardonnay, and Cabernet-Sauvignon. 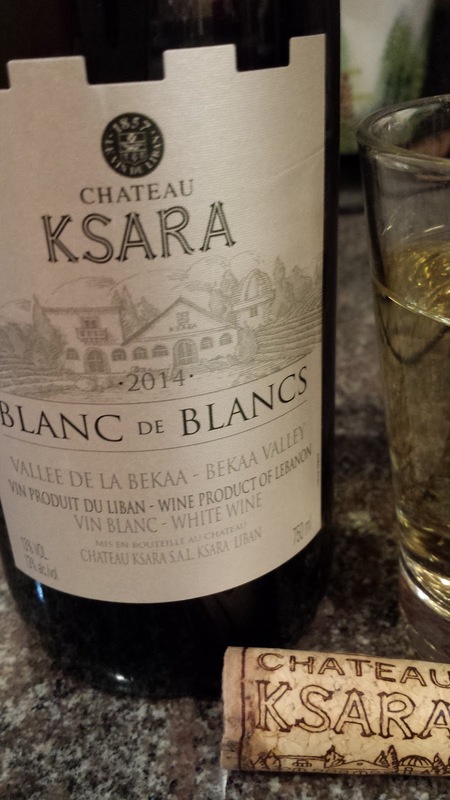 One of these vineyards would eventually turn into Chateau Ksara, the oldest and largest winery in Lebanon. The name translates to fortress as the current winery was the site of a fortress during the Crusader era. The Jesuit priests and other Lebanese wineries persevered through two World Wars and more recently civil war and Syrian & Israeli invasions. Eventually the Jesuit fathers sold Chateau Ksara to its present owners to conform with the directives of the Vatican II synod. 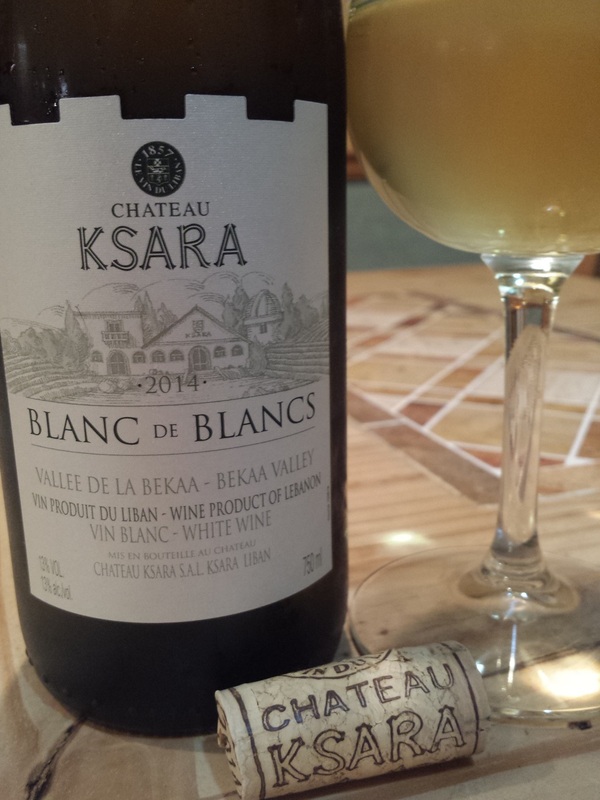 Today there are 33 wineries operating in Lebanon all based in the Bekaa Valley. Last week while browsing a local wine store I noticed the familiar Cuvée IIIème Millénaire label. Then I noticed another Ksara option, the Blanc de Blancs ($11), a Bordeaux-ish white blend of Sauvignon Blanc, Semillon, and Chardonnay. In general this is a nice wine, but a bit inconsistent with three noticeable sensations from nose to tail, but not fluid throughout. The nose is floral, the mid slightly nutty and creamy (four months in oak), and the finish is bright and acidic. For $11, well worth the buy. Update 9/2/2016: I received a complimentary bottle during the 2016 Wine Bloggers Conference of the same vintage of the Blanc de Blancs. The transition from start to finish was much more consistent with this bottle. A very nice value wine. Cheers. Spain wine regions are usually noted for their dry desert-like conditions and bold red wines. The major exception to this rule is the Galicia region of north-western Spain, located along the Atlantic coastline and bordering Portugal to its south. This is a wet and green region, plenty of vegetation that feeds off the 71 inches of rain per year. In comparison, Bordeaux averages half that at 37.4 inches/year. In this moisture rich environment red wines are a rarity and the white Albariño grape dominates. In fact it consists of 90% of all grape plantings and is the primary reason for the DO Rías Baixas denomination. During April and May we will be learning more about this region through the twitter based project #WineStudio. Protocol Wine Studio provides an agenda which elaborates on the many characters and pairings available with Rías Baixas Albariño. Below is some information you may have missed from last night. 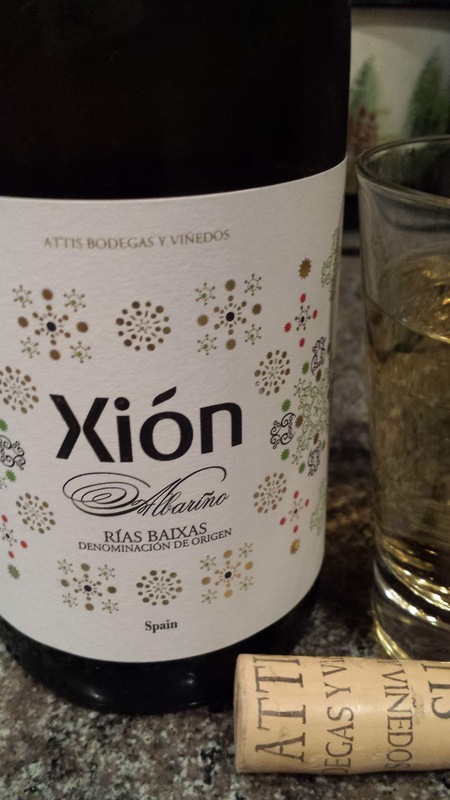 The DO was created in 1980, but when Spain joined the EU in 1986 the DO was changed to simply Rías Baixas as EU laws did not recognize a DO named for a single grape variety. I don't know why. 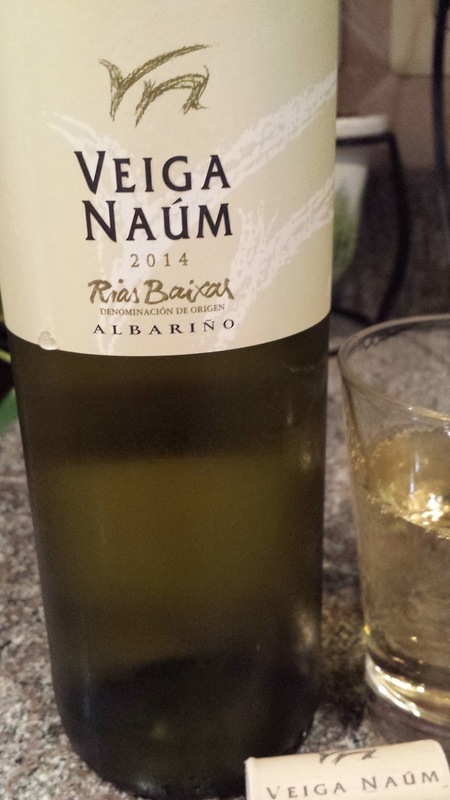 In order to be labeled Rías Baixas, the wine must consist of at least 70% Albariño - and with the amount of this grape grown, a rather easy goal. The denomination also permits six other types of wines which includes the Rías Baixas Albariño - 100% Albariño from any sub-region. (See box.) According to Rias Baixas Wines, DO Rías Baixas encompasses five distinct sub-regions. Ribeira do Ulla is the newest (formed in 2000) and is the most northern region. 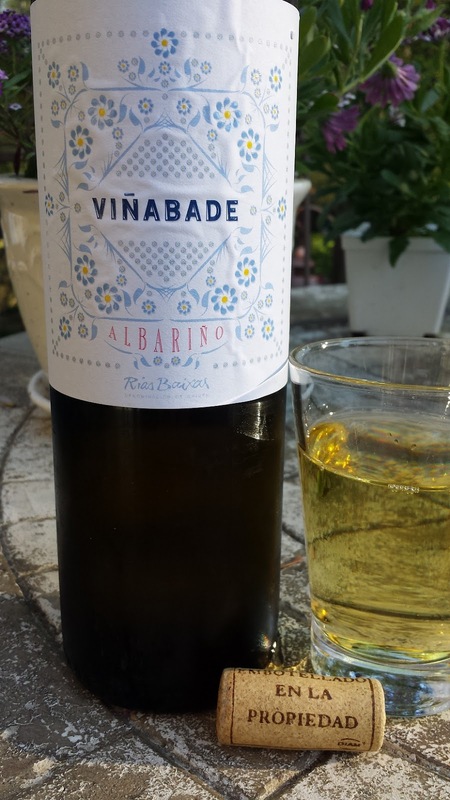 Val do Salnés is known as the birthplace of the Albariño grape. This is the original and oldest sub-region and it's fingers reach out into the Atlantic. Soutomaior is the smallest of the sub-regions and was registered in 1996. Soils are light and sandy over granite bedrock. Condado do Tea (The County of Tea) is named after the river Tea, a tributary of the Miño River which separates the border with Portugal. O Rosal also resides against the Miño River -- adjacent to the Atlantic. Because of the high rainfall and humidity grape vines are widely spaced and trained on stone pergolas and a wire trellis called a “parra". These parras can reach up to seven feet tall, allowing breezes to prevent mildew and to promote even ripening. During harvest, workers must stand on grape bins in order to collect the grape bunches. Despite the high rainfall amounts, Rías Baixas vineayrds are blessed with ample sunshine - averaging over 2,200 hours of sunshine per year. This sunshine in conjunction with the cooler climate provides an environment for high natural grape acidity. 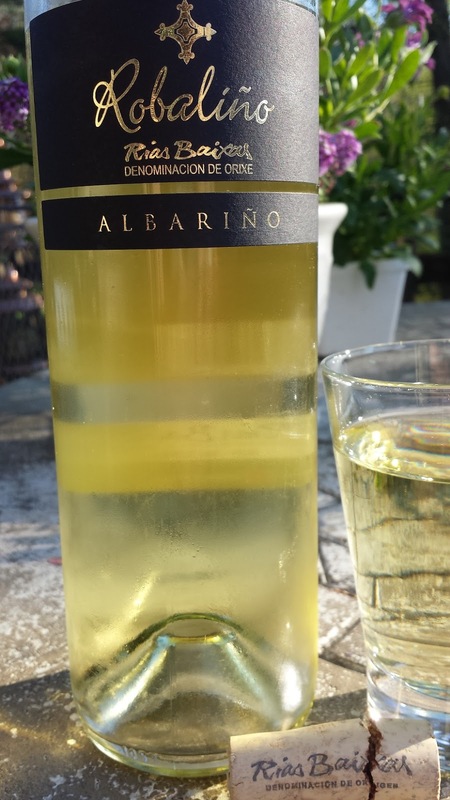 Albariño wines are also known for their floral and mineral character, most likely impacted soil composition within Rías Baixas. The bedrock is primarily hard granite with a top layer of mineral-rich alluvial (a combination of clay, silt, sand and gravel) formed from deposits eroded from running water. Hope to see you online next Tuesday night 9PM ET. Cheers. 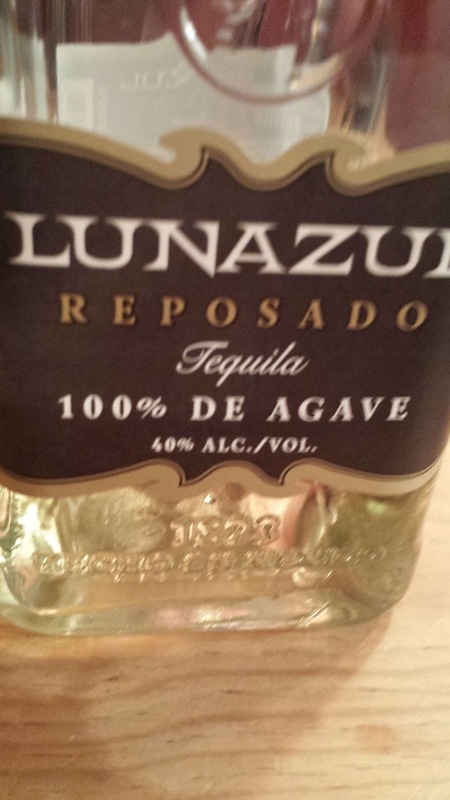 I needed an inexpensive tequila for a party and choose the Lunazul Reposado ($21) - 100% Blue Agave. Being a reposado, the tequila rested between two and twelve months in oak. In this case used bourbon barrels. Lunazul was founded by Francisco Beckmann, a seventh generation descendent of Jose Antonio de Cuervo. In 1992 he sold his stake in the family dynasty but kept his share of agave fields in order to start Tierra de Agaves estate and the Lunazul (Blue Moon) label. Today the distillery is controlled by his son Jorge who grew up working all phases of the operation - from harvest to distillation. The master distiller is Francisco Quijano who's distillation philosophy is to keep things simple. The Lunazul Reposado has a light flavor profile; oily texture with some vanilla and caramel with a smoky burn. This is a very serviceable tequila, at the price, a perfect mixer and if tasting straight go neat or just a drop of water. Over ice gets too diluted. Cheers.